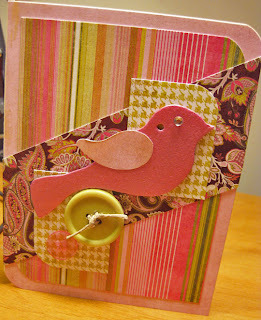 This is my card for sketch #3 on the Card Patterns blog. I will have to admit that it is one of my more looser interpretations of a card sketch. I really had fun making this card, although it completely changed during the creative process from what I had intended it to be. 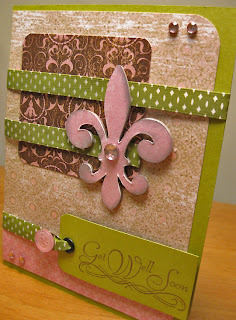 It's also doing double duty as my entry for this weeks challenge on the Card-a-licious blog. This week's challenge just asks you not to include a sentiment, it was too easy to pass up. 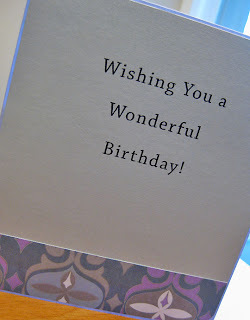 I also managed to squeeze in a card for sketch #104 on the CPS blog. And finally, since I am such a huge fan of all things Basicgrey I just couldn't pass on participating in this weeks Basicgrey Challenge. 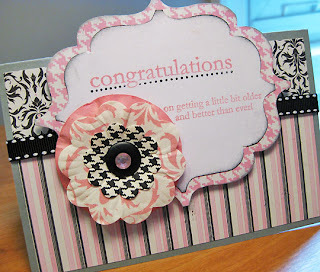 I used paper from BG's Sultry line to create this little card. Thanks for stopping by to have a look. I am often surprised by the way my body chooses to react to the stress I encounter in my life. Typically, when under stress, I suddenly forget how to get a good nights sleep and I feel a strong need to eat everything in sight. On very rare occasions, I do just the opposite with sleep and actually loose my appetite. Although, it's a great way to jump start that diet, it's definitely not the healthiest. Let's face it, no one likes stress or wants to be stressed out, but life would be plain boring with out it. 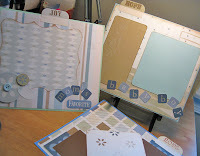 Lately, I find myself dealing with my stress by cranking out card creation after card creation-- go figure, actually a healthy, if not obsessive, way to deal with my stress-- I'm seeing progress! Because of my prolific card making I have been able to complete a bunch of cards for a few of this weeks current card challenges. First off, I actually completed one card to meet the requirements for two different challenges. I used Kazan's sketch 20 from this weeks challenge on 2S4U and I also played a long with the challenge on the Card-A-Licious blog. 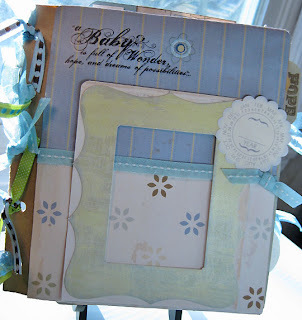 This is my first time participating in the Card-A-Licious challenge. It was a good week, since I just received an order of some beautiful green card stock, so I thought hey why not give it a try. Also, you just have to love anything with licious at the end of it! 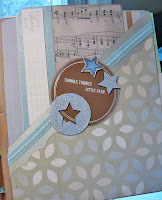 Second, I put together a birthday card using the current sketch on the CPS blog. 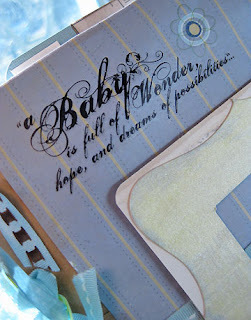 I love this paper from Making Memories and the matching paper flowers.They actually have an entire co-ordinating line with additional sized papers and embellishments available. 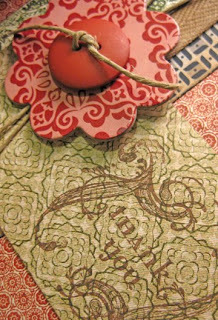 The included patterns are so eloquent and stylish; damask, hounds tooth and pin stripping-- you can't get trendier than this.This is actually the second birthday card I have made with this collection. 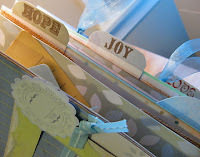 I find myself drawn to this collection whenever I have to make a birthday card for one of my amazing female friends. The color combo of pink, white and black is so eloquent and graceful-- it's a perfect testament to just how fabulous they are! Today we waved by-by to our old kitchen cabinets as they were carted off for scrap metal. 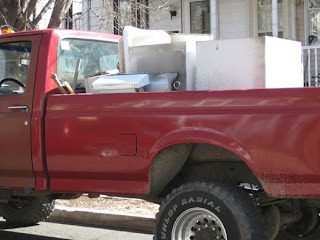 It was a very strange sensation seeing my old sink and cabinets loaded up onto a truck. For a brief moment I felt sad about it, but life goes on and a brand new sink is soon to be installed--well, maybe in a day or two (fingers crossed). I also got to say goodbye to a project that has been taking up room on my desk for a very long time now. 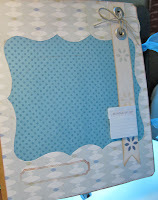 I finally finished the mini- album I have been making for my cousin's new baby. I had been putting off completing it with the excuse that I still had a few more weeks, well-- she had the baby on Monday! I'm so happy for her and although I have not talked to her yet I have heard that mom and baby are doing fine. Since I was not called into work today I thought I better use the time to finish up the album, because I intend to give it to her as a gift when I go and visit her and the little one. Although I am happy that I made this album, I am glad now to have finally completed it. I had been working on it in bits and pieces for about four months. It definitely was a learning experience for me, being the first album I had ever made. It's funny to see how my style evolved as I put each new set of pages together. Unfortunately, I 'm not too happy with the first few sets-- but by the time I realized this there was no turning back. I chose to go with muted colors for the album. 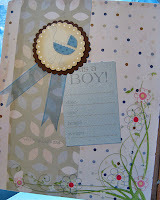 Although I wanted it to be all about baby boy, I didn't want it to be too pastel or frilly. 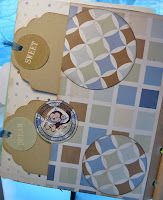 So I chose the muted colors and used geometric shapes to play up on the baby boy theme. I also tried to work in as many journaling spots as I could. I'm thinking this will be a great album for her to save all her very favorite pictures and memories of her new son. When they are little there is barely any time to sit down and write about all of the new things they are doing and your own thoughts on being a mother. This way when she has a few free minutes she can sit down with a stack of her fav. 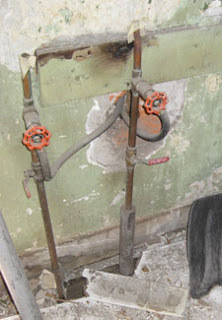 pics and jot a few thoughts about them. It will be something she'll be grateful for in the future. In the end, I wonder if she will like the present. As I look it over I realize that it has a very eclectic style, while that works for me, she's more of a "everything needs to match" kind of girl. Well, hopefully she'll know that it's a gift that comes from the heart and as a new mom, she'll probably be excited for yet another reason to show off her new baby. In the future I plan to make a few mini-album's featuring my own little guy-- but will probably not choose this for a gift option again any time soon. 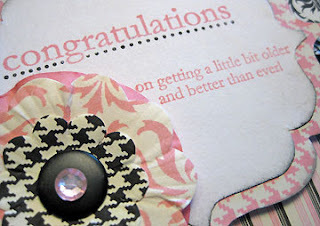 I recently found a brand new sketch challenge on the web called Card Patterns. It is just their second challenge and I am very excited to be able to participate in it. This card started out as a masculine Birthday card, but like so many creations it seemed to veer off it's intended path as it started to come together and ended up as a Thank You card. It still has a very masculine feeling to it, thanks to Basicgrey's Boxer DP. I am still planning on making that Birthday card for a friend of the family and will try and go back to the Boxer paper to see what else I can come up with. 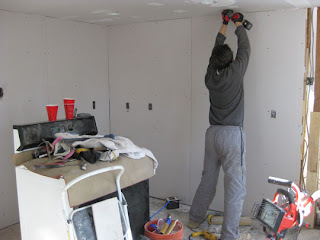 I am very excited, we have walls--and a ceiling! Also, wanted to share a card I recently completed. I haven't had much time for crafting these past two weeks, but what I did work on I really enjoyed. Once again, getting caught up in the creative process is such a great way to deal with stress. 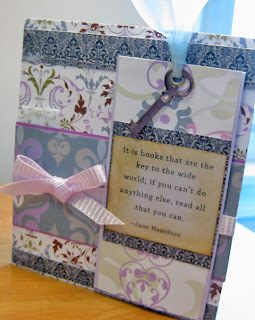 This card was actually a request for a person who loves books. 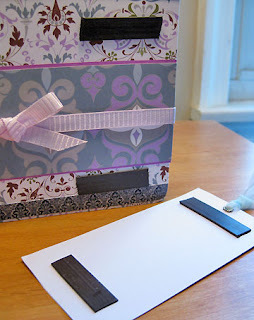 This was really fun, since I got to incorporate two things that I really love into one project, reading and card making. I actually borrowed the idea for this card from two sources. 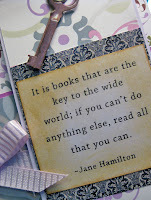 I recently saw a card on-line that incorporated a bookmark and I saw a beautiful handmade bookmark in a recent issue of Paper Craft, that's where I found the wonderful quote. The idea for the magnets was all mine. It was the easiest way to secure the bookmark to the card, and it serves a double duty-- it also makes a beautiful magnet that can be displayed on the fridge as well! 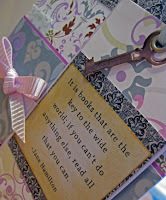 The only problem I ran into was how to fit in a Birthday sentiment while not clashing with the bookmark quote. I thought about fitting it in on the front, but then felt there would be too much going on in the same space. 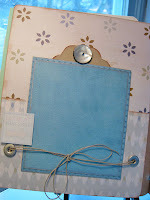 Finally, I decided to include an inside greeting, tying it together with matching DP. 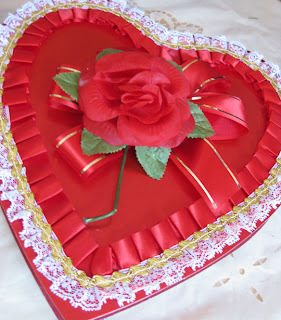 Happy Valentine's Day, and what a beautiful day it is here in Central Jersey for Valentine's day. I'm sure many couples and family's are out together enjoying this suprisingly spring like weather. Unfortunatly, I'm sitting alone in my living room thinking of ways to pass the time. My little guy is spending the next few days at his grandparents, and my hubby who is only a few yards away from me is out of reach and unavailable as he is currently in the midst of our huge kitchen re-modeling. Thankfully, I have a box of chocolate to keep me company and to help take my mind off the chaos that was once known as my kitchen. Just a few pictures to share of the current state of things. 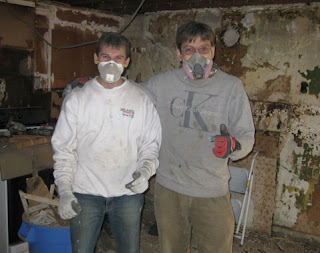 *My hubby and his buddy shortly after they demoed are entire kitchen. 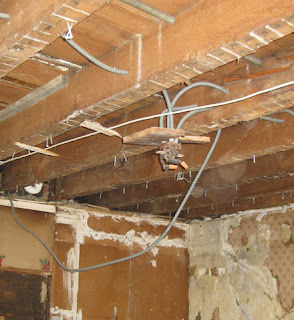 * The exposed ceiling beams. * Where my sink used to be. 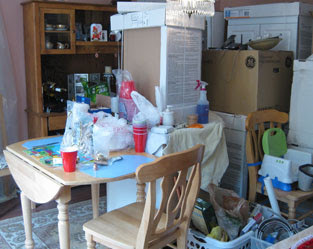 Our fridge is currently in our dinning room, along with our microwave, our kitchen table and all of the other contents of my kitchen, as well as our new dish washer and a pile of the new cabinets. I can hardle believe there is any free room left in my house at all. I spent all day Thursday cooking so that I could load my fridge with food for us to eat that could easily be warmed up in the microwave-- after that runs out, I'm going to start ordering take out. 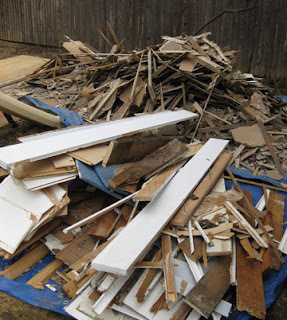 I'm not sure which is scarrier, the mess inside my house or the pile of trash, remains of the old kitchen, that is now collecting in our backyard. Luckily we have a local dump that will take most of the trash, but I have no idea how we are going to get it there. OK-I think I need to eat another piece of chocolate right now. On the bright side, I spent a really enjoyable Valentine's day morning with my little guy at my parent's house. He's just the perfect Valentine! 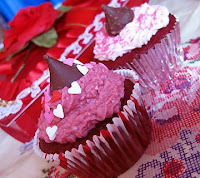 We spent the morning eatings some Valentine's day cupcakes and watching Peter Pan. His grandparents bought him a toy nail gun for a V-day present, which he just loved-- although he's already running around with it as if it's some kind of weapon instead of pretending to build a log cabin or something. Well, in a few years he will be ready to jump into any project that my hubby has going on. Although things are crazy right now and life is once again turned upside down, I am trying to stay focused on the positive. In a month or two I will have a wonderful new kitchen, that will really help to improve the everyday quality of our lives-- and it's all thanks to my hubby's hard work. In the mean time I still have half a box of chocolates to help me cope with the stress!! This is a Flickr badge showing items in a set called Hand Stamped Cards. Make your own badge here.